One of the big product announcements at CEDIA Expo 2012 came from our longtime friends at Antennas Direct. There is just nothing else like this antenna. Take a look: This is the Antennas Direct DB8e. This is the one to get if you need to get UHF reception from 65 miles or more. What you see here are a total of four antennas that work together in one massive array using a custom-designed combiner. What’s so special? Aside from the mind-blowing 17.4dBi gain (estimated, of course) the construction of the DB8e is going to amaze you. 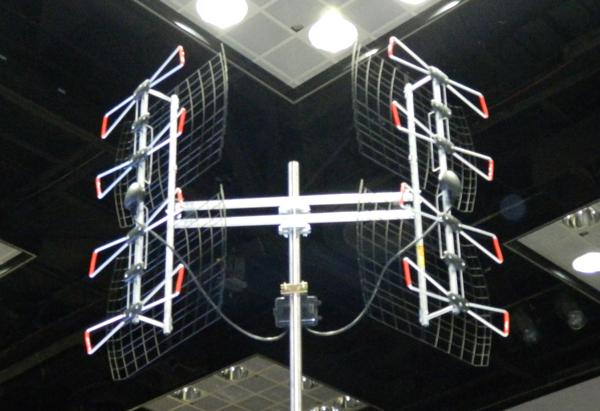 The antennas are arranged on two brackets that allow the antenna to be aimed in two completely different directions. If you’re stuck between two markets, this is the antenna for you. For example, take my old friends in Haverhill, Massachusetts… 35 miles from Boston and 30 miles from Manchester NH. Point this one antenna in two directions and you don’t need a rotator to get all the channels in your area! This antenna is a massive beast full of industrial-strength construction. It’s 48″x36″, about 1.3 1 meter, in size. Put it on the roof or in the attic… this is no indoor antenna, that’s for sure. My overall impression: very solid build quality. With an antenna you always have to compromise between strength and light weight, and I think this is the perfect balance for such a large antenna. The DB8e is designed for UHF-only; they make no promises about VHF-High. Still with a massive piece of metal like that it’s pretty likely that you’ll get something from a sufficiently strong signal. Antennas Direct’s top staff was kind enough to give us a lot of their time and you can tell that they are super-excited about this antenna. They had it mounted on a BMW motorcycle for a mobile testing lab. It was the hit of the show… people were drawn to TiVo’s large booth graphics and immediately swerved to see the massive antenna pointing to the ceiling. The DB8e is still in prototype form so watch this blog to see when it becomes available.